The images on the cushions are prints from Lindsay's original three-dimensional embroidery. The fabric is a heavyweight upholstery cotton velvet mix, woven and printed in England and sewn into cushions on the Isle of Wight. They come in four different sizes. The black cushions have a plain black velvet backing while the grey cushions have a plain grey velvet backing. All cushions have duck down pads, which are over-filled to prevent the velvet pile from crushing and to keep them permanently plump. All orders placed with Lindsay Taylor through this website are covered by these terms and conditions. 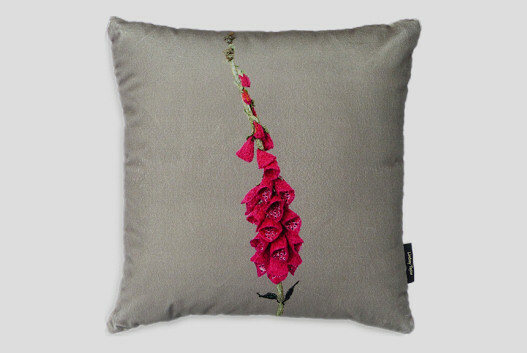 The cushions are made to order and will be dispatched within 2-3 weeks.